Today’s Topic: What, if anything, is too serious to be joked about? Humor is a great tool in the right hands. As for topics that are too serious, I can’t think of one. Obviously you must take the audience into account before telling the joke but all topics are up for grabs so to speak when it comes to joke telling. 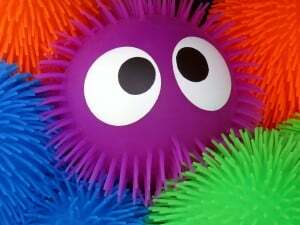 Crazy things kids say or do? Sure. Religion? Why not. Race? If done right, absolutely! There’s nothing that you should never joke about, but it depends what that joke is. Next week’s topic: Has education become more about temporary results and grades than long-term success and knowledge? Is there anything you believe too serious for jokes? No Giveaways or reviews please, we want to stick to our topic or whatever thought-provoking topic you have decided on your own. We want to get to know you personally not what you like or give out right? Make sure that you follow all the hosts! (Mumfection, Home Maid Simple, Tim and Angi’s). Pop in and let them know you’re following via GFC and/or Facebook (or whatever your following method is). Only thought-provoking posts, which is why we always have a great topic for you prepared in case you are just having a blank day. 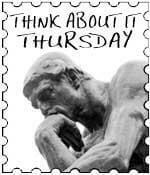 Make sure your post has our Think About it Thursday button! Have fun, make some friends, follow, comment thoughtfully and above all else be respectful! Lastly, we would love it if you suggest some topics for us to discuss! Who knows if we pick your topic, we may feature your blog! hazza you’re like me it’s everything or nothing! 😀 If you can’t laugh about it, what can ya do right?